Interior of Christ the Saviour Cathedral. Christ the Saviour Cathedral (Храм Христа Спасителя) is the mother cathedra or see of the Russian Orthodox Patriarchate, whose current primate is His Holiness Patriarch Kirill of Moscow and all Russia. The cathedral is located on the north bank of the Moskva River to the immediate southwest of the capital’s Kremlin fortress, where, inside the Dormition Cathedral (Uspenskiy Sobor) all Russian tsars and tsarinas have been crowned and anointed. 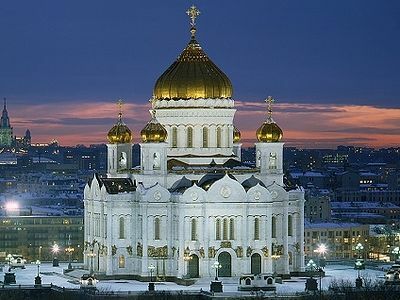 Christ the Saviour is the tallest Orthodox cathedral in the world, standing at 103 metres (338 feet) above the pavement. The main sanctuary (temple) can fit over 10,000 standing worshipers. Christ the Saviour Cathedral, Moscow. On Christmas Day in 1812, Russian Imperial forces drove the last of Napoleon Bonaparte’s Grand Army off of Russian territory — once 600,000 men strong, now a mere 20-30,000 remained. In thanksgiving, His Imperial Majesty Emperor Alexander I (1777-1825, r. 1801-1825) signed a Manifesto ordering the construction of a magnificent Cathedral in honor of Christ the Savior in Moscow as a thanksgiving to God and to honor the victorious Russian army. To signify Our gratitude to Divine Providence for saving Russia from the doom that overshadowed Her and to preserve the memory of the unheard of efforts, loyalty and love for our Faith and Homeland displayed during these difficult days by the Russian people, We hereby intend to build a Cathedral in honor of Christ the Saviour in our capital city of Moscow, wherein the appropriate Decree will be issued in due time. May the Almighty bless Our intentions. May our intentions be fulfilled. May the Cathedral stand for many centuries. Let the incense of thanksgiving, together with love and a desire to imitate the feats of our anscestoral feats, burn before the holy altar of God for many generations. After over 40 years of initial construction paid for by donations from across the Russian Empire and with imperial patronage, the cathedral was first consecrated on 26 May 1883 in the presence of Emperor Alexander III and senior members of the Imperial Family along with numerous Church and foreign dignitaries. Demolished on Soviet dictator Stalin’s orders on 5 December 1931, the site was initially envisioned to hold a colossal monument to Marxist-Leninism, a gaudy skyscraper called the “Palace of Soviets” raised to the memory of Lenin. Here is a brief video showing the cathedral’s destruction. Fyodor Klages (1812-90). “Interior of the Cathedral of Christ Saviour in Moscow” (1883). The cathedral before its destruction. Photograph taken of the demolition of the cathedral on Stalin’s orders, 5 December 1931. Plans for the “palace” stalled during the Great Patriotic War (WWII), and afterwards the foundations were turned into the world’s largest open-air swimming pool, in which numerous Soviet citizens drowned. Following the collapse of the Soviet Union in 1991, the newly-free Moscow Patriarchate announced plans to rebuild the demolished Cathedral on its pre-revolutionary model and scale. Funds poured in from all across the former Russian Empire, including from Russian emigres living in Western Europe and the Americas. 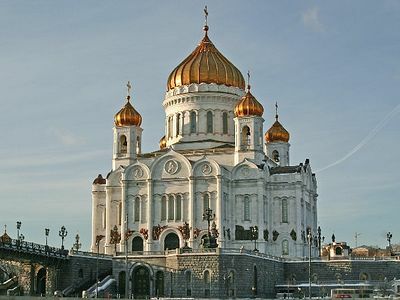 Construction was finished by 2000, and HH Patriarch Alexey II consecrated the new cathedral along with numerous other Russian clergy on 19 August 2000. Besides functioning as the Patriarch’s cathedral church, the building is a monument to the suffering of the Russian people under communism and a symbol of the resurgence of Orthodoxy in Russian cultural life following 1991. Every year, the President and Prime Minister of the Russian Federation attend Nativity (7 January on the civil calendar/25 December on the Julian) and Paschal midnight services in the cathedral, and are greeted with an address by the Patriarch, who they in turn address with the traditional festive greeting “Christ is Risen!”, “Truly He is Risen!” (Христос Воскресе! Ваистину Воскресе!). In front of the iconostasis (icon stand/wall) and altar solea inside the cathedral. Here I present a look at the history of the Cathedral of Christ the Saviour in Moscow. Built as a result of Napoleon’s retreat from Moscow, the Cathedral was a thanksgiving for Russia & the victorious Russian Army. Construction lasted for 40 years & resulted in the largest Orthodox Cathedral in the World. Following the Russian Revolution, Stalin had the Catherdral blown up to make way for the Palace of Soviets, a “skyscraper” to Socialism & the memory of Lenin. Only the foundations were built by the time Hitler invaded Russia in 1941. Work ceased & following victory in 1945, the foundations were turned into an open-air pool. I actually swam there in 1966…… In 1994, the pool was closed and the Cathedral of Christ the Saviour rose again. This time taking a mere fraction of the time to build. This is the story……..
His Holiness Patriarch Kirill Is Enthroned At Christ the Savior Cathedral His Holiness Patriarch Kirill Is Enthroned At Christ the Savior Cathedral The enthronement of His Holiness Patriarch Kirill of Moscow and All Russia took place at the Cathedral of Christ the Savior on February 1, 2009. 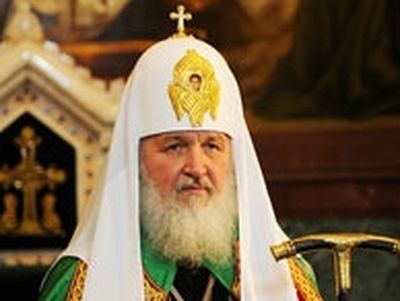 He was elected to the Moscow Patriarchal Throne by the Local Council [Pomestny Sobor] of the Russian Orthodox Church on January 27. Fire came down on people from the sky when the foundation to the Christ the Savior Cathedral was laid Fire came down on people from the sky when the foundation to the Christ the Savior Cathedral was laid One of the participants in the ceremony of laying the foundation to the Cathedral of Christ the Saviour Archpriest Leonid Kalinin tells about unusual event that took place during the ceremony on January 7, 1995, and was considered a miracle. On This Day: Cathedral of Christ the Saviour Founded in Moscow Paul Gilbert On This Day: Cathedral of Christ the Saviour Founded in Moscow Paul Gilbert On September 22 (O.S. September 10), 1839 the Cathedral of Christ the Saviour was solemnly founded by the Metropolitan of Moscow Filaret on the Alexeevsky hill in Moscow to commemorate the 25th anniversary of the end of the Patriotic War and storming of Paris in March of 1814.